While not as complex as some polycultures, the sweet potato/bush bean/wildflowers (in my opinion) go beyond companion planting and interplanting. The sweet potato vines provide a living mulch that suppresses weeds and protects the soil from erosion and the sun (conserves moisture). The bush beans are legumes and are able to provide nitrogen to the soil. 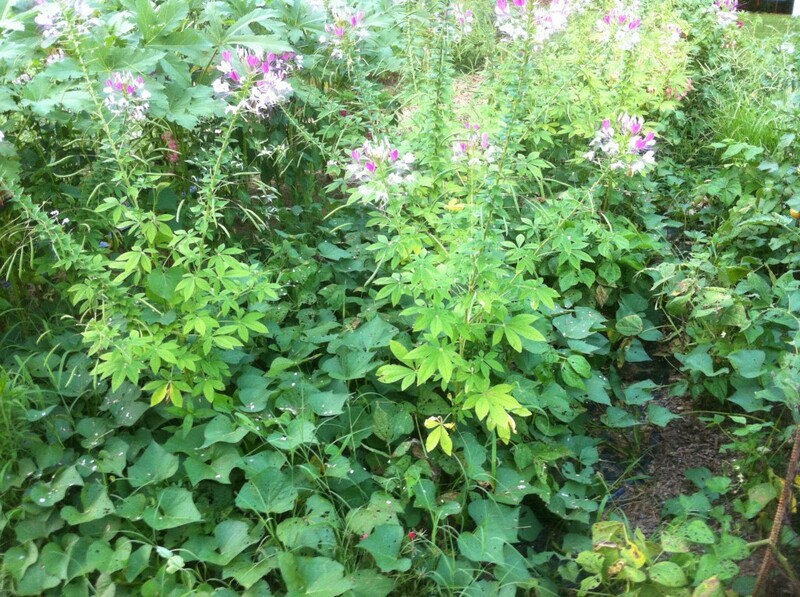 The wildflowers found in this bed are cleome (spider flower), garden balsam, and rose moss. All of these come up as volunteers all throughout our gardens. All three are excellent at attracting beneficial insects that will act as pollinators and predators to help balance pest problems. Rose moss also can be an excellent ground cover, though the sweet potato vines already do an excellent job in this bed. Garden balsam is also edible and has medicinal value.